Here is a little more fall inspiration in case I haven't showed you enough already. I thought I would share with you my front door wreath. I was going to put my burlap wreath on the door this year but after making it I decided I really liked how it looked on my window and I forgot I had this one I made last year. 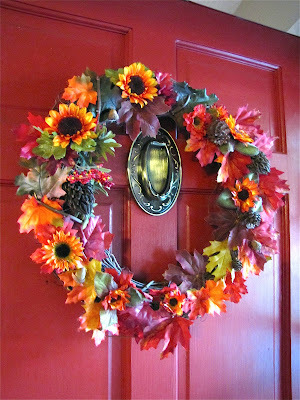 I just used a twig wreath and hot glued flowers and other fall items onto it. Most of the flowers and leaves I already had in my fall collection and some of the items I gathered from outside. I'm not sure what these are called but we found them on one of our walks around the block. They still look pretty good a year later. We have a million acorns that fall in our yard and they look really pretty as long as I can get them before the squirrels do. One of my neighbors had pinecones and my daughter would collect some every time we walked by so they came in handy for this project. Here's a picture of us along with some more fall items we added to the porch. So what do you think? Do you like to make a new wreath every year or do you recycle your old one? Linking up with Southern Hospitality. Yeah! .....so glad you commented today. I love the wreath and the pic of your beautiful family. It was so, so good to see you on Sunday! !